Most A/E firms derive 70-80% of their business from repeat clients. That's good. Unfortunately, one survey found that over 50% of our clients would be willing to switch from their current providers. Other research suggests that only one in four clients would recommend their primary provider. So the hold you have on your loyal clients may be more tenuous than you thought. This is particularly true in a bad economy. Yet never have your loyal clients been more essential to your firm's well being. 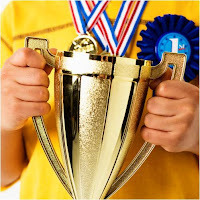 Are you willing to go the extra mile to retain those vitally important clients? There's a simple (in concept)--yet not so simple (in practice)--formula for making your firm indispensible: Give your clients value they can't get from your competitors. The primary advantage you have with ongoing clients is the relationship. Clients typically stick with their current providers, not so much because they think they're the best, but because they have an existing workable relationship. So have you assessed the relationship with your top clients? One way to think of this is the simple formula: Satisfaction = Expectations - The Experience. How do you know your clients are satisfied? The first step is to clarify what their expectations are about the working relationship. Almost no one does this in any formal sense. 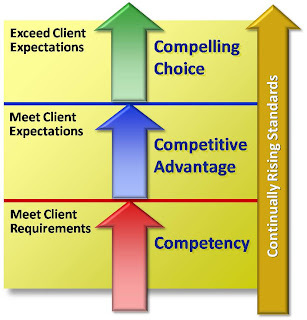 This is the "benchmarking expectations" step in my client service delivery process. Then you need to ask how the experience of working with you has gone. By my informal survey, only one in four firms do this routinely. Check out this earlier post on how to solicit client feedback. Requirements. Stated explicitly verbally or in writing, typically in the form of an RFP, work order, or contract. Usually define specific, impersonal, and objective conditions for meeting needs and satisfactory performance. Scope, schedule, budget, and technical criteria are the primary project requirements, and too many in our industry are comfortable proceeding with only this information. Expectations. Typically unstated unless asked. These are usually more personal, subjective, and sometimes less specific criteria for establishing a strong working relationship. It will involve intangible measures of trust, responsiveness, concern, and connectedness. Understanding expectations is key to making yourself indispensible to clients. To become the compelling choice, you have to move beyond simply meeting requirements. You need to meet and exceed expectations. Some firms throw around marketing slogans like "we exceed expectations" without even understanding what that entails, much less actually doing it. It's a high standard, seldom achieved. But it is achievable. The following diagram depicts three service value thresholds. Meeting requirements makes you competent, critically important but the client expects no less. Meeting expectations gives you a competitive advantage. Firms often don't even know what the expectations are, so meeting them consistently puts you in rare company. Exceeding expectations makes you the compelling choice. Of course, if this was easy everybody would be doing it. That's precisely the point. One more challenge to keep in mind: When you exceed expectations, you in effect set them higher next time. So remaining the compelling choice would seem to commit you to a process of continuous improvement. Then again, until your competitors start doing a better job of uncovering client expectations, outdoing other firms in this regard might be easier than you thought.